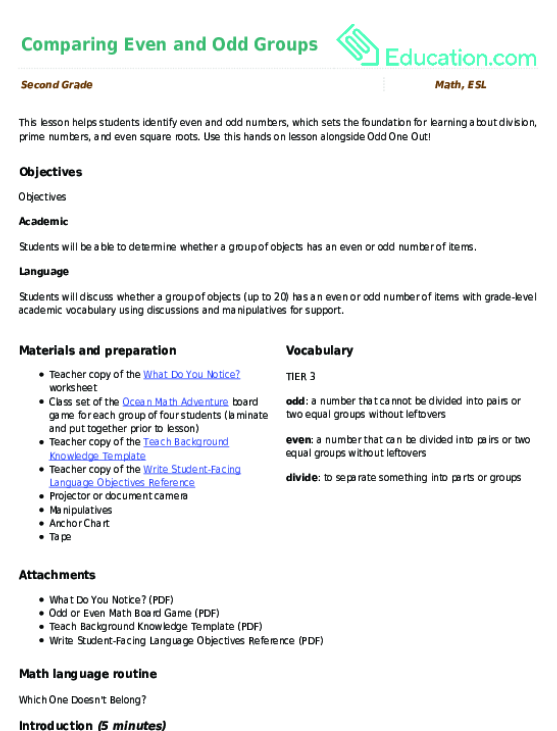 Students will be able to classify numbers as odd or even. Read If You Were an Even Number by Marcie Aboff aloud to the class. 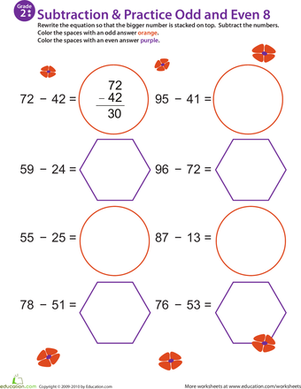 Ask students if they'd rather be an even number or odd number. Have students explain their reasoning. Tell students that they will be playing a card game called "Even Numbers Rule." Explain that the first step is writing the numbers 1–30 on index cards, with one number on each card. Tell students that Even Numbers Rule is a game for two people to play. Each person will get 15 cards to start. They should shuffle their cards and put them in a pile. Have a student come to the front of the class and model how to play. Tell the class that the pair will count to three and each student should place the card that's on top of their pile face up in the middle. Whoever has an even number says "Even!" and takes both cards. If both students have an even number, the student who says "Even!" first gets the cards. If it's not obvious who said "Even!" first, the students can do a face-off where they put down one more card each and play again, with the winner taking all the cards. The game goes on like this until one player runs out of cards. 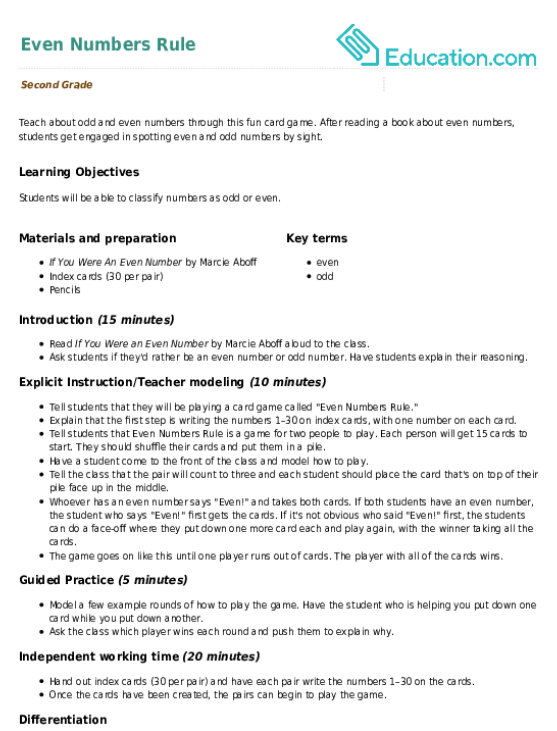 The player with all of the cards wins. Model a few example rounds of how to play the game. Have the student who is helping you put down one card while you put down another. Ask the class which player wins each round and push them to explain why. Hand out index cards (30 per pair) and have each pair write the numbers 1–30 on the cards. 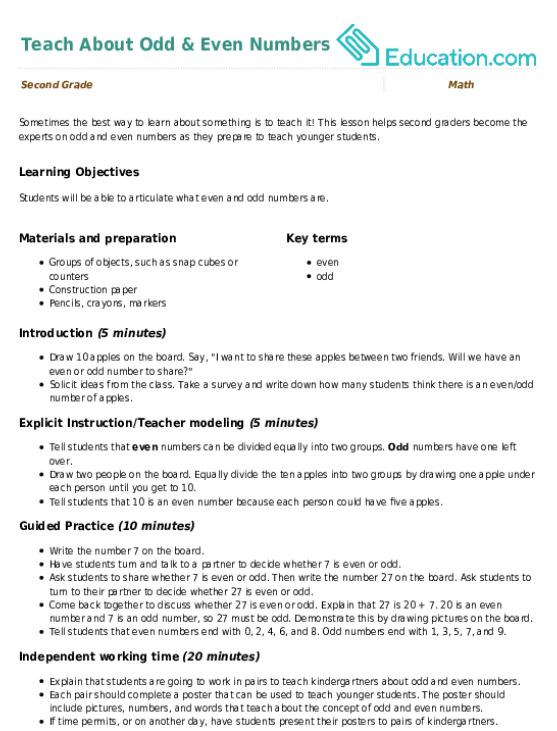 Once the cards have been created, the pairs can begin to play the game. 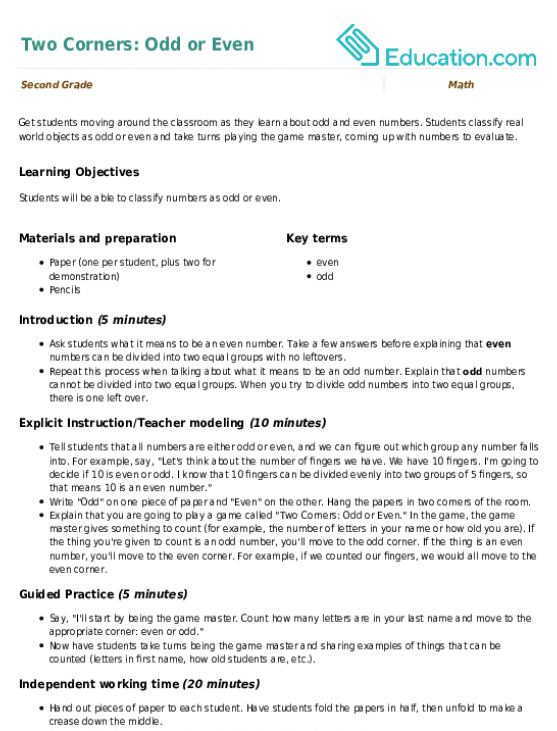 Support: Have students play with only the numbers 1–10. 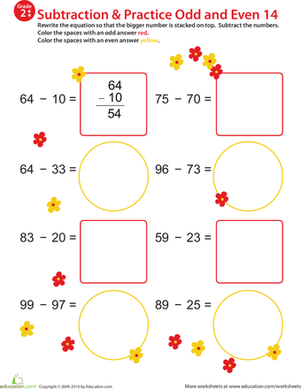 Enrichment: Have students play with the numbers 1–50. 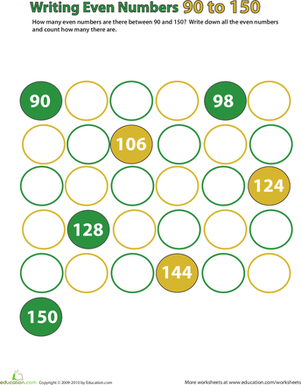 Assess how students are recognizing odd and even numbers. Bring the group back together. Ask students to popcorn share even numbers 1–30. Teach about odd and even numbers through this fun card game. After reading a book about even numbers, students get engaged in spotting even and odd numbers by sight. 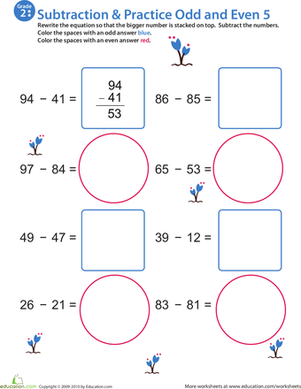 In this 2nd grade math worksheet, your child will practice writing even numbers and counting by 2 from 90 to 150 as he writes the missing numbers in the spaces. This lesson helps second graders become the experts on odd and even numbers as they prepare to teach younger students. This lesson helps students identify even and odd numbers, which sets the foundation for learning about division, prime numbers, and even square roots. Use this hands on lesson alongside Odd One Out! 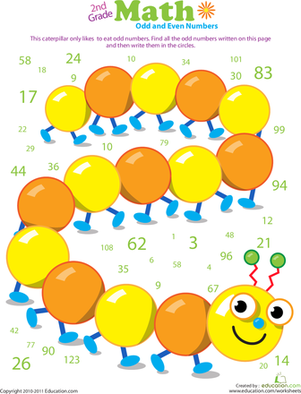 Get students moving around the classroom as they learn about odd and even numbers. Can your second grader track down the odd numbers, and write them on sections of the caterpillar's body? Help your kindergartener determine whether numbers are odd or even with this bright, engaging game board. Practice counting and number sense, too! 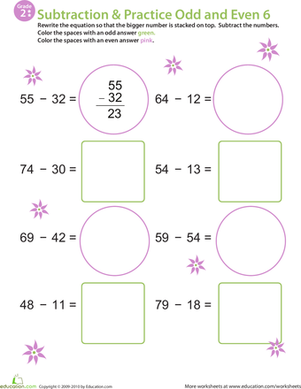 Challenge your second grader to master subtraction as well as odd and even numbers with this fun printable! This colorful printable encourages your second grader to practice subtraction as well as odd and even numbers! Boost your second grader's subtraction skills and ability to identify odd and even numbers with this colorful 2-in-1 worksheet! Here's a fun and colorful way to teach your second grader important concepts: subtraction and odd/even numbers. Incorporate both double-digit subtraction practice and an exercise identifying odd and even numbers into your second grader's math practice.